Home > Shop By Brand > Optimum Polymer Technologies > Optimum Opti Clean Concentrate 128 oz. New formula cleans better while providing a higher gloss finish! One product cleans and protects every automotive surface. Optimum Opti™ Clean is the ultimate one-step product. It cleans and protects all automotive surfaces in one step. Use Optimum Opti™ Clean on paint, vinyl, rubber, metals, plastics, and even glass! You'll save time, effort, and money while achieving a clean, well-protected vehicle. Optimum Opti™ Clean does it all! Optimum Opti™ Clean is a combination of substantive polymers and cleaners that safely removes dirt and grime and leaves a glossy protective finish on all automotive surfaces. Optimum OptiTM Clean is based on the same natural polymers used in Optimum No RinseTM. It is safe for use on all automotive surfaces and it's safe for the consumer and the environment. Optimum Opti Clean is in a category by itself! It cleans like a waterless wash, but it offers better protection and gloss. It shines like a premium quick detailer, but Optimum Opti Clean has better cleaning ability and provides superior paint protection. It has no equal. Optimum Opti™ Clean can be used anywhere! It dries clear and non-sticky so use it on the dashboard, plastic instrument gauges, and glass! On the exterior, you can depend on Optimum Opti™ Clean to provide real protection to tires and wheels, paint, and metals. The trick with applying Optimum Opti™ Clean is to use different towels for different surfaces to avoid cross-contamination. For example, you wouldn't use a wheel towel on glass. Designating glass towels, interior towels, and exterior towels will help you get the best results on every surface with Optimum Opti™ Clean. Optimum Opti™ Clean is perfect for detailers and mechanics. Quickly wipe down an entire vehicle before giving it back to the client. Not only will it look fantastic when it's picked up, it will continue to look great long after the client drives it home. Talk about a great impression! For do-it-yourselfers, Optimum Opti™ Clean allows you to clean and shine your entire vehicle - inside and out - in just a few minutes. You may be picking up friends or a date, headed to a car show or car club event, or just in the mood for detailing. 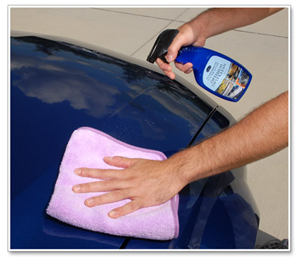 Optimum Opti™ Clean simplifies car care. You don't have to have a garage full of products to have a clean, shiny vehicle. You just need Optimum Opti™ Clean. and paint and all exterior surfaces. Dilute 1 part of Optimum Opti™Clean Concentrate with 3 parts water. Spray liberally on painted surfaces and wipe clean with a plush microfiber towel. Fold and use a new section of the towel as needed. 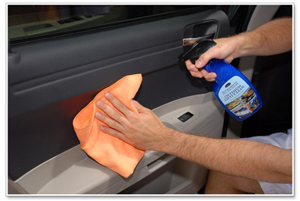 For glass and interior surfaces, apply one or two sprays and wipe off with a clean, plush microfiber towel. 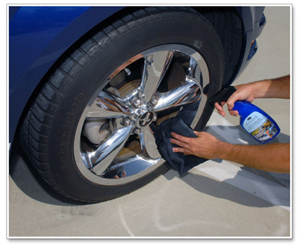 For lower panels and wheels, spray liberally and let it soak for a few seconds and then wipe off. When there is heavy dirt build up, use Optimum No Rinse™. I've used most of the other WW on the market and like this the best. Has highest lubricity. Use generous amounts, then using high nap MF towel (no hand pressure) all the dust/dirt comes off easily on first pass. Follow immediately with short nap / waffle weave towel to finish drying / buff up shine. Key is to NOT let this product start drying or you will get streaks / marring, especially on warm days. Spray 1/2 hood, or only one door panel then immediately start removing /buffing. Just needs some reorientation to working on one panel at a time instead of spraying down an entire side. If it starts drying then re-wet, or use detail spray. The resulting slickness will allow water to slide right off the surface, better than any other product used, including Meg's Ultimate Spray Wax. Even the feral cats who used to sleep on my hood have stopped as they too just slide right off. I live in high dust farm community. The added slickness blows more dust off the car when driving than other products previously used (CG EcoSMart, Adams Rinseless Wash, Microfibertech Pure Luster, and Meg's Wash and Wax Anywhere). All around the best WW I've used. I alternate with Pinnacle Liquid Crystal to add shine. ProsSuperior surface lubricity which remains to provide best-of-breed hydrophobic results. Alternate with Pinnacle Liquid Crystal (or other) to add shine. ConsNeed to work on single panels / 1/2 hood at a time to avoid streaking / marring. If it happens just re-wet or use detail spray to restore surface. Great hydrophobic results are worth re-orienting your approach to washing. I can complete SUV wash in 20 minutes. I USE IT LIKE WATER!!! Nothing in my arsenal gets used more than this stuff. I love it for interiors, especially cleaning gloss black and clear plastics without scratching. Obviously using the right towels and techniques are crucial but this product leaves a streak-free, super clean surface if you are doing it properly! I use it a lot as an instant detailer. What better option for instant detailing than something meant to SAFELY WASH YOUR CAR WITHOUT WATER??? Every time I bring my car back home, I clean the front facing areas with it. I fold my towel in quarters, spray one side liberally and go to town. If I have to go past one area, I'll reverse the towel to the other side of the previously wet quarter, re-prime and clean the rest of the car with that. If there is a particularly tough residue from a bug or bird doo, You can spray some on the spot, put the towel under it to keep it from running down and let it soak for a few seconds, then wipe. By far one of the best AIO product i found. Dr. G makes some great products. Very easy to use. its a concentrate and must be diluted correcly to perform at its best.